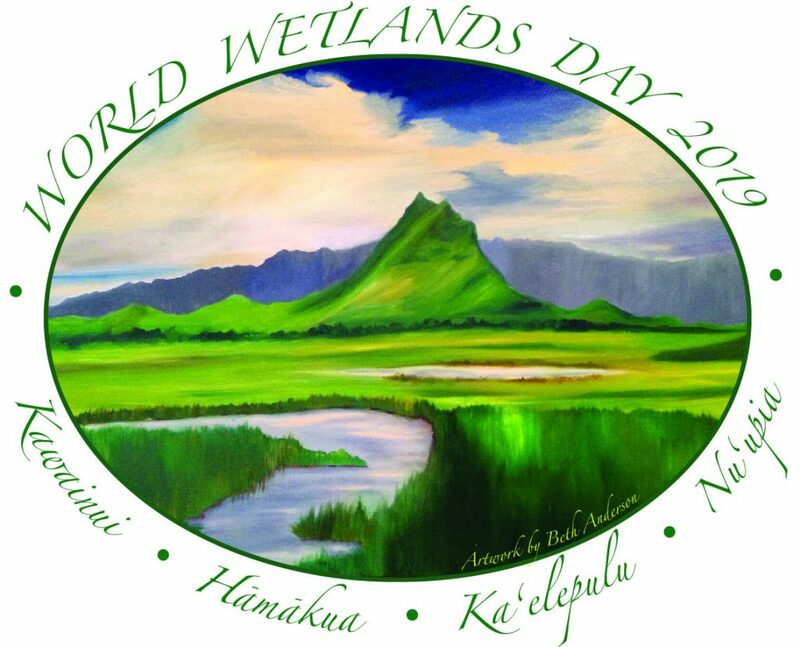 Again, this year, DLNR is partnering with environmental and community organizations to host World Wetlands Day at Kawainui-Hāmākua on Saturday, February 23. This family-friendly event celebrates the designation of Kawainui-Hāmākua as a Ramsar Wetland of International Importance. In keeping with the 2019 theme of Wetlands and Climate Change, a forum with government, researchers, and community leaders will address the impacts of climate change on the wetlands of the Kailua ahupua‘a. This forum will be held at Holman Hall, Kailua United Methodist Church, from 10:00am until 12:00pm. In addition, free bus tours around Kawainui-Hāmākua and to Maunawili Valley give people an opportunity to explore these special places and to learn about the resources associated with the wetlands of Kailua. Space on the tours is limited and sign-up will be available at the event. It will be held at Kailua United Methodist Church (1110 Kailua Road) from 9:00am to 2:00pm. On the church grounds there will be exhibits about wetlands and climate change, games and activities for the keiki, and poi pounding (ku‘i ‘ai) demonstrations. It’s a short walk to nearby Ulupō Heiau State Historical Park where there will be tours of the site, the restored lo‘i kalo, and cultural demonstrations. Parking for the event is available at Kailua United Methodist Church and adjacent Kailua Baptist Church. Overflow parking is available at nearby Windward YMCA, Daybreak Church, and Christ Church Uniting. Each year since 1997, government agencies and community organizations have offered programs aimed at raising public awareness about the values and benefits of wetlands. There are currently 2,339 Ramsar wetlands worldwide. Kawainui-Hāmākua was designated a Ramsar Wetland of International Importance in 2005 in recognition of both its cultural significance as an ancient fishpond and its value as a wetland habitat for Hawaii’s endangered waterbirds. At approximately 800 acres in size, Kawainui is the largest extant wetland in Hawai‘i. Nearby Hāmākua is 23 acres and is located adjacent to Kawainui Stream that connects the two wetlands. Today, the two wetlands are managed by the DLNR Division of Forestry and Wildlife as wildlife sanctuaries. These wetlands also provide flood protection for Kailua. The DLNR Division of State Parks manages several areas around the edge of the wetlands, including Ulupō Heiau State Historical Park and Kawainui State Park Reserve.